In this week’s address, President Obama called on Democrats and Republicans to work together to grow the economy and get Americans back to work. The President has outlined a number of steps Congress can take right now to spur growth and create jobs, including extending tax cuts for working and middle class families, cutting red tape to encourage new businesses to grow and hire, passing trade deals that will support tens of thousands of jobs, and giving our out-of-work construction workers opportunities to rebuild our nation’s infrastructure. This week, Congress reached an agreement that’s going to allow us to make some progress in reducing our nation’s budget deficit. And through this compromise, both parties are going to have to work together on a larger plan to get our nation’s finances in order. That’s important. We’ve got to make sure that Washington lives within its means, just like families do. In the long term, the health of our economy depends on it. But in the short term, our urgent mission has to be getting this economy growing faster and creating jobs. That’s what’s on people’s minds; that’s what matters to families in this country. And the fact is, this has been a tumultuous year for the economy. We’ve weathered the Arab Spring’s effect on oil and gas prices. The Japanese earthquake and tsunami’s effect on supply chains. The economic situation in Europe. And in Washington, there was a contentious debate over our nation’s budget that nearly dragged our country into financial crisis. So our job right now has to be doing whatever we can to help folks find work; to help create the climate where a business can put up that job listing; where incomes are rising again for people. We’ve got to rebuild this economy and the sense of security that middle class has felt slipping away for years. And while deficit reduction has to be part of our economic strategy, it’s not the only thing we have to do. We need Democrats and Republicans to work together to help grow this economy. We’ve got to put politics aside to get some things done. That’s what the American people expect of us. And there are a number of steps that Congress can take right away, when they return in September. We need to extend tax cuts for working and middle class families so you have more money in your paychecks next year. That would help millions of people to make ends meet. And that extra money for expenses means businesses will have more customers, and will be in a better position to hire. Yesterday, I proposed a new tax credit for companies that hire veterans who are looking for work after serving their country. We’ve got a lot of honorable and skilled people returning from Iraq and Afghanistan, and companies that could benefit from their abilities. Let’s put them together. We need to make sure that millions of workers who are still pounding the pavement looking for jobs are not denied unemployment benefits to carry them through hard times. We’ve got to cut the red tape that stops too many inventors and entrepreneurs from quickly turning new ideas into thriving businesses – which holds back our whole economy. It’s time Congress finally passed a set of trade deals that would help displaced workers looking for new jobs, and that would allow our businesses to sell more products in countries in Asia and South America – products stamped with three words: Made in America. And we ought to give more opportunities to all those construction workers who lost their jobs when the housing boom went bust. We could put them to work right now, by giving loans to companies that want to repair our roads and bridges and airports, helping to rebuild America. Those are a few commonsense steps that would help the economy. And these are ideas that have been supported by both Democrats and Republicans in the past. So I’m going to keep calling on both parties in Congress to put aside their differences and send these bills to my desk so I can sign them right away. After all, both parties share power. Both parties share responsibility for our progress. Moving our economy and our country forward is not a Democratic or a Republican responsibility; it is our responsibility as Americans. That’s the spirit we need in Washington right now. That’s how we’ll get this economy growing faster and reach a brighter day. President Obama should have discussed the downgrade during his weekly address. He either does not want to fuel the fire or forgot to bring the water. Can anyone take a guess now as to where Obama is going with Alan Krueger? I think if the Republican party would go back to a more centrist conservative point of view and rethink globalization I would join their ranks again. A stimulas like the last one that uses "Made in China" goods is going to be another huge waste of money. Obama already lost his FDR moment with poor planning on infrastructure projects. What this administration does not understand is materials and the labor to assemble goods must be made here in the USA to help put Americans back to work and stimulate economic growth. When I see actual bridges built in China that are coming to New York and San Francisco, it shows government knows how to save money. But, it also shows government does not really understand the meaning of a stimulas. Mr. Speaker stop the political jousting and let the President speak to Congress. MR. CARNEY: I don't want to speak for the leaders of Congress, but I know you all did learn that the President requested of the leaders that he speak to a joint session of Congress next week on September 7th at 8:00 p.m. Beyond that, I don't have any announcements, so I'll start with your questions. Q Can you talk a little bit about why he's going to do the speech before a joint session of Congress as opposed to some other venue? MR. CARNEY: Sure. The President feels that we are at a moment when we need to take significant action to spur economic growth and to create jobs, to accelerate hiring, and that that action can be -- there are significant things we can do if we work together in Washington. And that requires working with Congress. And he believes that if members of Congress, while they've been on their recess, have been hearing the same things from regular Americans that he heard when he was on his bus tour, then they will come back with a sense of urgency and a focus and determination to do the kinds of bipartisan things that we can do right now to increase growth and increase job creation. So he believes that the venue is appropriate because of the actions that need to be taken. MR. CARNEY: No, of course not. There were a lot of considerations that once you decide you want to do a speech to Congress, and you have to deal with congressional schedules and there are many other factors here. And obviously one debate of many that’s on one channel of many was not enough reason not to have the speech at the time that we decided to have it. MR. CARNEY: We make consultations obviously with networks all the time about the timing of presidential speeches. Q Can I follow real quick -- I'm sorry. Q The gentleman from Reuters. (Laughter.) Any concern that -- as you know, it's at the Reagan facility. Any concern of potentially upsetting Nancy Reagan by stepping on this? MR. CARNEY: I think that the -- the sponsors of the debate control the timing of it; they can make a decision based on how they want to handle this. There are many channels, there are many opportunities for the public to hear the President speak, to watch this debate -- one of many -- and we'll let that sort itself out. Q Two questions on the speech. The President said yesterday in a radio interview that the government could take steps that could spur growth by up to 1.5 percentage point and add a million new jobs. Is that an indication of the scale of the proposals he's going to lay out? MR. CARNEY: No, I think if you look at the full quotation, the full context of that comment by the President, he was speaking generally about economic models -- economic analysis and models that say every one -- roughly -- I'm not an economist -- but every 1 percent of growth equals -- generally equals T-K number of jobs, this many million jobs or 100,000 jobs. So that was not a reference to his proposal. I'll leave the details and the projections of added growth and job creation to the speech itself and to the analysis afterwards. That was more a reference to general economic analysis says if you take measures to increase economic growth by this percentage, it will result in this many jobs. Q Okay. And then, secondly, is this a job speech, or is it a jobs and deficit speech? Because the President has referenced the importance of bringing down the deficit over time. Is it going to include proposals for the super committee? MR. CARNEY: The President made clear his commitment to present to the so-called super committee, special committee, joint committee in Congress that's going to deal with further deficit and debt reduction his own specific and detailed proposals. He will do that. This speech next week, he will certainly put the need for jobs -- job creation and economic growth within the context of an overall long-term plan for dealing with growing our economy and getting our fiscal house in order. But the speech tomorrow -- rather next week will focus on the immediate need to create jobs and spur economic growth. It will obviously -- it will contain -- there will be many elements of it. I don't want to over-preview it here, but the commitment to present a detailed proposal on deficit reduction remains. And as you know, I believe the committee meets for the first time the following week. Next week he will focus on jobs and growth. MR. CARNEY: Again, I’m not going to get into the specifics. It will be a significant speech with many elements to it, but I don't want -- I want to be clear that the President is focused very much on steps we can take together -- Congress, the administration -- to grow the economy and create jobs at this important time in the American economy. Q On housing, Jay, is the White House working on a new proposal at this point? MR. CARNEY: As you know, restoring the health of the housing market after its dramatic collapse is an important goal and it’s not an easy task. We have been committed since the day this President was sworn into office to taking measures -- taking steps that will help us do that, and we continue to look at new ideas for how to do that. There’s many measures that we have taken that have resulted in many, many families being able to stay in their homes, to restructure their mortgages and to allow themselves to stay in their homes. And we think that’s very important, and we’ll continue to look at measures. Most recently over the summer, as you know, the President put forward an initiative of expanded forbearance for unemployed homeowners to allow them to stay in their homes, and he began a process to deal with the excess of foreclosed properties, to help stabilize communities and home values. And we continue to look at new ideas. Q But HAMP and the unemployed, underwater, and the states’ help -- I mean, those things are sort of incremental and have -- for HAMP especially -- have served many fewer people, millions fewer people than the administration initially said they would. How imperative is it from the President’s perspective to help those people, millions of people who are underwater on their home loans, to refinance? MR. CARNEY: The President, as I said, continues to be focused on this issue. It’s not an easy task. I would note that over 760,000 homeowners have obtained permanent remodifications -- modifications, rather, to their mortgages under the HAMP program you reference, and that on average over the past six months, 25,000 to 30,000 more homeowners are obtaining permanent modification each month. And when you combine that with the assistance provided through HUD and the steps that the private sector has taken, another 5 million families have been offered modifications between April 2009 and December 2010. And we will continue to look at measures and to take steps that can improve the prospects for homeowners and to allow them to stay in their homes, including -- evidence of the fact that we’re constantly looking for new ideas on this issue are the two measures that I just referenced. Q It sounds very decoupled, though, from jobs and deficit reduction. It’s something, maybe, that is a lesser priority than those other things when you look at the timing? MR. CARNEY: I think these are all priorities. And the housing challenge that we continue to face is part of the economic challenge that we face, there’s no question. And he is focused on that as part of his overall highest priority, which is the economy and jobs. Q Have Leader Reid and Speaker Boehner accepted the President’s request to address the joint session? MR. CARNEY: I have not -- obviously, we just submitted this letter. I have not heard from them yet, personally. Q The President is requesting this time to address the joint session of Congress at the same Republicans are holding a debate. Would you describe that timing as coincidental? MR. CARNEY: I was already asked this, actually, by the first question -- by Darlene and I think I answered it. It is coincidental. There is -- the President committed to speaking next week after the Labor Day holiday and immediately upon Congress’ return. And there are a lot of factors that go into scheduling a speech before Congress, a joint session speech. And again, you can never find a perfect time. There are major events that occur on television. There are other issues that you have to deal with, as well as congressional scheduling and the President’s scheduling. So as I just noted, there are many channels, there are many opportunities for people to watch the President, and obviously, an opportunity for people to watch the debate. And I leave -- the network involved here can decide how it wants to deal. MR. CARNEY: I’m saying that Congress isn’t in session, is not back on Monday, for example -- or on Friday. It’s not -- there are other issues that have to go into any of these kind of scheduling decisions. MR. CARNEY: The President has already made clear that precisely because we need to take measures to enhance growth, accelerate hiring, he will call on the committee dealing with the need for fiscal soundness to overshoot its goals, to pass a program that -- his program will call for greater deficit reduction, greater savings than the target set by the legislation that created the super committee. MR. CARNEY: The answer is, yes, it will be paid for. Q -- and one is the long-term deficit reduction. MR. CARNEY: Absolutely paid for. Q But the jobs speech stuff will be paid for? Q I understand. We also work in a political world where it's not like this White House doesn’t know that the Republicans are trying to trump the President that night. So that didn’t play a factor at all? MR. CARNEY: It did not. I can honestly tell you -- and again, the President -- this is about the President addressing the American economy, the need to grow the economy, the need to create jobs. This is the right time to do it, the right day to do it, given all the other considerations. So that's why we asked for it. Q And on the economy and jobs, you say in the speech he wants to talk about bipartisan proposals, things that Republicans could support. It seems like he started the ball rolling today with the highway jobs. But we heard the same talk from the President in January 2009 with the stimulus -- shovel-ready projects, this was going to create a lot of jobs -- that didn’t pan out. So what's really new about this? Why would the American people be confident that the jobs are going to be created? MR. CARNEY: I understand there's a political issue that some folks are arguing that it didn’t do enough; obviously others on the other side argue that it should have been bigger and could have done more. What is an indisputable fact is that the hole created by the recession that this President took office during was 8 million jobs large. That is a fact -- that the recession that was in full bloom, if you will, when the President took office ended up costing the American economy 8 million jobs; 8 million Americans lost their job because of that recession. And that is the economic environment in which this President took office and began to take measures to address that problem. And the measures he's taken have -- working with Congress -- have resulted in, again, over 2 million private sector jobs being created, economic growth as opposed to economic contraction. Recovery is not happening fast enough. Job creation is not happening fast enough. That is why he will address the American people and the Congress next week to talk about measures that we can take together to do right now to enhance growth and job creation. Q -- that it didn’t create as many jobs. MR. CARNEY: You’re confusing two things. When the President spoke today with the CEO -- the COO of the Chamber of Commerce and the head of the AFL-CIO by his side, as well as many others, he was referring to a clean extension of the Surface Transportation bill, the highway bill, if you will, that has had broad bipartisan support for years, that has been extended without issue seven times in the last two years, and that the failure to do that would -- could potentially jeopardize up to a million American jobs. That is separate from the jobs and growth proposals he’ll put forward next week and has nothing to do with whether or not projects are ready to build. This is a program that has been in place for years, that has been supported by Democratic and Republican Presidents, Democratic and Republican congresses. The reason why the President came out today to talk about it is that, unfortunately, we do not live in the kind of political environment that we used to, where you cannot take for granted that things that had bipartisan support will have it going forward, and you cannot take for granted, after we went through the debt ceiling debate, where some members of Congress seemed willing to threaten the American economy and the global economy to make a political point -- you can’t take anything for granted. So the President went out today to say, look, Congress has to do this. We should not create any more self-inflicted wounds. We certainly have to take action to grow the economy and create jobs, and we absolutely must not take action that will result in the loss of jobs. We saw this in the FAA thing. It was a wholly unnecessary, self-inflicted wound that resulted, for a time period, in people losing their jobs and not getting a paycheck. Q That brings up a question. FEMA funding, highway bill, FAA -- normally things that are popular in Congress, or relatively non-controversial anyway -- the President told Tom Joyner yesterday he’s going to communicate with the American people and he wants the next election to be a referendum on a Republican Congress, as opposed to a referendum on his presidency, I assume. Is this an effort, the venue, probably the most conspicuous of all venues, in prime-time, to sort of go big and put Republicans in a very public box on this? MR. CARNEY: As I said I believe the other day, and again yesterday on Air Force One when we were flying to Minneapolis, the President’s goal is for Congress to act and act quickly to pass the proposals he will put forward next week. And there, again, if we -- in normal times, the proposals he puts forward next week would gain substantial, broad bipartisan support, especially in an economic situation like we face now. He is hopeful that members of Congress of both parties will, during their recess, have heard from their constituents the same things that the President heard from Americans in Minnesota, Illinois and Iowa, when he was on his bus trip a few weeks ago, and the week before that when he was in Michigan -- the American people -- Republicans, Democrats, independents -- are fed up with the kind of political posturing and gamesmanship that used to just result in gridlock and what’s perceived to be incompetent, but proved itself during the debt-ceiling debate to be dangerous, that did harm to the American economy, and therefore did harm to average Americans. We can’t have that. We can’t afford it. And the President believes that members of Congress will come back, having heard from their constituents, and will understand the need to take action -- sensible action -- to grow the economy and create jobs. MR. CARNEY: You yield to the Wall Street Journal? Q Will the President include an estimate of how many jobs his plan will create or what sort of growth it might produce when he lays out his proposal? MR. CARNEY: The President will -- I can just say generally without getting into the specifics of the speech that will not be delivered for another week, that the President is confident that outside economic analysts will judge his proposals to be beneficial to the economy and beneficial to job creation. And they will make those measurements. As far as what projections we make, that remains to be seen. But we are absolutely confident the kinds of proposals the President will make will be judged by reputable, nonpartisan, independent economic analysts to be pro-growth, pro-job creation. MR. CARNEY: I was just asked this question, and again, we -- the President believes that and understands that the challenges facing the housing market after its collapse remain, and we will continue to take steps as we’ve taken since the beginning of this administration to try to alleviate that, to help homeowners stay in their homes. And we are constantly evaluating new ideas and taking action, as he has just this summer with the two programs I mentioned. And by "constantly," I mean not just in the past, but going forward. Q Just one more thing on the debate. Would the President prefer, would he like that the organizers to move it up so that it doesn't coincide with his speech? MR. CARNEY: I’m not -- we’re not going to get into the scheduling for sponsors of debates or television. Given the options we had, the fact that we believe that it is the right venue and the right time to speak for this kind of a speech, we asked for the time that we asked for. Q -- voting process. And a debate like this is an important piece of that process. MR. CARNEY: Maybe the wildlife -- but the -- (laughter.) What I mean is that would it were so that I could be sure simply by having the President of the United States speak at a certain hour that every American who is watching TV would be watching him. I wish that were the case. Certainly, a substantial number of Americans will. I would personally, and I’m sure the President feels the same way, welcome -- if the sponsors so chose, and the candidates so chose to adjust the timing of their debate so that it didn't conflict, that would be completely fine with us in the spirit of democracy and that. But, again, I think that we live in such a world of choices in terms of getting information and watching media, that there will be ample opportunity for Americans to hear and see the President, ample opportunity for Americans to hear and see candidates for office. And so we’ll just carry forward with our plan. MR. CARNEY: By any historical measure, yes. MR. CARNEY: It is an excellent point that you make that even when the President has put forward ideas that have been historically affiliated with the Republican Party, that suddenly they have been unappealing to some members of Congress. Q So what makes you think they’ll see this as bipartisan? MR. CARNEY: Because they will have heard from their constituents. They will have heard that the vast majority of Americans, whether they voted Democratic or Republican, whether they're registered Democrats or Republicans or independents, just want their elected representatives to get to work and to get things done. They do not care who wins the ideological debate. They do not care who scores the most political points. In fact, they're infuriated when they see that take precedence over the need to do the things that need to be done to help them, to help the American economy grow, to help the private sector grow and create jobs. Look, I think it is entirely likely that most representatives of Congress will have heard that message from their constituents during the recess. Now, I can’t predict behavior, but the President certainly hopes that, having heard that, lawmakers will return to Washington with a sense of purpose and seriousness that will enable us to do things in a bipartisan way to grow the economy and create jobs. If that's not the case, we will continue to push -- the President will continue to push to get it done. But he certainly hopes that it will be the case. Because, again, as I said, I think in answer to Mike’s question, it used to be that political gridlock and partisanship when it reared its head and it made Washington dysfunctional, people were like, oh, my God, it’s just so incompetent and it’s frustrating. Now, they were treated to the spectacle of Washington politics threatening to do direct and immediate harm to their livelihoods and to the American economy. And that's just not acceptable. MR. CARNEY: Well, I think what the President was doing then and will continue to do is to call on the American people to insist that Washington, Congress, their representatives, respond to their desire that action be taken. And it’s not about winning a fight or a political battle. It’s about insisting that things that have broad bipartisan support, things that make eminent sense to assist the economy to create jobs, get passed and signed into law, for the sake of all the American people. Q Do you have any other further schedule updates to give us? Q And nothing this weekend, no plan of looking at any of the hurricane damage or tropical storm damage? MR. CARNEY: I don’t have anything for you on that now. Thanks. Q Jay, I’m just a little confused between the disconnection between the deficit part of this, which you say he’s going to give his ideas to the super committee at some other time, and this jobs speech. MR. CARNEY: Well, let me just -- I don’t mean that in a literal sense. I simply meant that the President made an explicit commitment to provide the joint committee that will be -- that is tasked with finding further ways to reduce the deficit and deal with our long-term debt, a specific, detailed proposal. He will do that. Now, I was asked about will that be part of the speech next week. And, again, without getting into details, I just want to make clear that the reason he is going forward to Congress, to the American people, next week is to talk about actions that we can take to create jobs and grow the economy now. There is the broader context, without question, that we need to -- Congress can, if it behaves rationally, we can do things not just to grow the economy and create jobs, but as was demonstrated by the process over the debt ceiling debate, that there is ample bipartisan -- could be ample bipartisan consensus for getting our long-term fiscal house in order. MR. CARNEY: These are related. There’s no question they’re related. The immediate task here is to spur growth and accelerate hiring. Q Right, but because the Republican argument is the best way to spur growth is to cut government immediately and not spend any more money, he has to answer that argument on Wednesday night, doesn’t he? MR. CARNEY: Well, look, again, I don’t want to get into the specifics. There’s no question that within the context of this he will, as he has in the past, talk about how we can take actions now to enhance growth and accelerate hiring within the context of doing the things that we need to do for the long term to get our deficits under control, our debt under control, and to create the kind of economic environment we need to dominate the 21st century in the same way we did the 20th. And that includes investments in infrastructure, education, clean energy and the like. MR. CARNEY: Well, I mean, and how -- the President is committed, as he made clear, to more deficit reduction than has been mandated by Congress. And one of the reasons to do that is to pay for the measures that need to be taken to grow the economy and create jobs now. Q And he will discuss that on Wednesday? MR. CARNEY: I think I’ve said -- I mean, I think the answer is yes. But, again, I want to be understood that the focus here is on jobs and economic growth -- which is not to say -- all of these are of a piece. What the American -- what needs to be done now is Congress needs to come back, having heard from their constituents, and do the things that the President will put forward that should have bipartisan support, that will be judged by economists and independent analysts to be pro-growth and pro-job creation, and to take action quickly so that those things can have an effect. Also, Congress has mandated as part of the agreement that was reached to raise the debt ceiling that this super committee take action by shortly before Thanksgiving that would further reduce the deficit and reduce the debt. And the President is going to be very engaged with a specific and detailed proposal about how he believes we should do that in a balanced way, in a way that will actually enhance growth, enhance confidence, and not balance the back on the budget -- balance the budget, rather, on the backs of individual sectors of society so that some sectors can continue to get broad tax cuts or enjoy loopholes in the tax code or subsidies. So that will be all part of the package. Q Three of the Republican candidates for President are sitting House members. Where would the White House expect them to be next Wednesday night? MR. CARNEY: The White House has no expectations. We’ll leave that to individual choice. MR. CARNEY: Foreign what? Affairs? Q Jay, two questions about the speech. The media sponsors for the debate are big boys and they can sort of take care of themselves on this, but it’s also sponsored by the Reagan Library and Mrs. Reagan is very much involved. MR. CARNEY: I was asked already. I feel like there’s a lot of echo effect. MR. CARNEY: We could all -- Republicans might enjoy the prospect, the candidates might enjoy the prospect of responding to the President. Again, but it’s not for us to decide how that plays itself out. And everyone will decide according to their own best interests, I’m sure. Q On to the speech itself. We spent a fair amount of time on that bus tour talking about bipartisanship. MR. CARNEY: You know you enjoyed every minute. Q I enjoyed it. It was wonderful. The corn dogs were terrific. Q The pie was great. You guys talked a lot about bipartisanship. The Republicans are always accusing the President of being Professor Obama, standing up at a lectern, telling them what to do. How does this particularly move this process along of actually getting a negotiated deal? MR. CARNEY: Not in my time. Q Has the President spent any -- over this summer period, has the President reached out to any of the leadership? Have there been -- is there any attempt to sort of build these private bridges, as opposed to having these large public events? MR. CARNEY: Glenn, as you know, and as you exhaustively covered, and everyone here, and as the American people witnessed and probably grew exceedingly tired of, the President spent an inordinate amount of time with the leaders of Congress earlier this summer -- in telephone conversations, in private meetings, and meetings that you all were brought into at the top of or bottom of. I don’t think the American people, or, for that matter, members of Congress, are looking for more quality time with the President or anyone else. They want things done. The President will put forward proposals that should in a normal world have broad support, and he hopes that they will once he puts them forward next week, and Congress will act. Because the American people want Washington to work, and are fed up with Washington not working. And when it becomes a question of harm as opposed to incompetence, it's even more frustrating. Q Jay, as the President has considered the options for the jobs initiatives that the advisors have gone over with him, can you describe how he has weighed what job creation could be available immediately, if that’s the imperative? And I’m thinking in terms of what he learned from the not enough shovel-ready jobs. In other words, he’s not talking about jobs in 2014, he wants them now. MR. CARNEY: Well, I think it’s fair to say that we want action to be taken soon so that -- because those actions will have a direct and quick effect on economic growth and job creation. The slowing of our recovery, the slowing of job creation needs to be addressed now. So, yes, we’re interested in measures that would have quick effect. MR. CARNEY: Well, I think the whole economic team was looking for -- led by the President -- was looking for -- has been examining proposals, listening to ideas from outside -- people the President has met with and spoken with, as well as members of his team -- that are effective; that, again, judged by independent, outside economists and analysts will be judged pro-growth and pro-job creation, and will take effect quickly -- because the need is now. But within the context of his overall vision that he has discussed frequently, about the need to make wise -- even as we get our fiscal house in order, to make -- I mean, one of the reasons why you need to take a balanced approach to deficit reduction is so that the burden of it is fairly shared, but also to allow for the kinds of investments in innovation and infrastructure and education that will ensure that we grow economically not just next year or the year after, but into the next decade and beyond. So that’s part of his overall vision, because we need to -- that’s why we need to dominate the industries of the future, the innovative industries of the future. That’s why we need to educate -- to take measures to invest in education, because education is directly related to your capacity to compete globally. I mean, the Chinese, the Germans -- nobody else is waiting around to win this competition. So we have to move quickly, in concert with Congress, to do the things necessary to assure that America remains the most powerful economy in the world. MR. CARNEY: We’d be very happy. MR. CARNEY: Again, I don’t want to -- I think it obviously depends on how quickly Congress acts, what the specifics of the legislative proposals are, and how they get implemented. But I do say, yes, to your question, which is --was the focus here on proposals that would take effect quickly -- yes. MR. CARNEY: The President believes we can get that -- no, the Congress should -- on measures that can be taken, that should have bipartisan support, that could grow the economy and create jobs, Congress could and should act quickly, and should not wait until Thanksgiving or Christmas. Q What do you think is the realistic window for Congress either to act or not act on this? MR. CARNEY: I’ll leave that to you to decide or to analyze. Again, I think it goes back to questions I took in the beginning -- it depends on the disposition of lawmakers as they return from their recess, and what they heard from the constituents, and the kind of imperative they’re operating under when they get back and what their priorities are. Q And on Glenn’s point, no additional -- beyond what happened before the break, no additional private consultation with Republican members? MR. CARNEY: The President is -- well, you called them private consultations, so if I talked about them they wouldn’t be private. So the President is in conversation with leaders of Congress frequently -- or has been, again, broadly speaking, over the last weeks and months. I’m not going to get into specific conversations he has had about these proposals that he’s putting together, except to say, as I did I believe the other day, that he’s consulted with folks outside of the administration as well, obviously, as with his economic team. MR. CARNEY: I think I was just was called to a conclusion here. Thanks. Thank you for your letter requesting time to address a Joint Session of Congress next week. I agree that creating a better environment for job creation must be our most urgent priority. For months, the House has been implementing an agenda designed to reduce economic uncertainty, remove unnecessary government barriers to private-sector job creation, and help small business, and we welcome the opportunity to hear your latest proposals. As your spokesperson today said, there are considerations about the Congressional calendar that must be made to prior to scheduling such an extraordinary event. As you know, the House of Representatives and Senate are each required to adopt a Concurrent Resolution to allow for a Joint Session of Congress to receive the President. And the Majority Leader announced more than a month ago, the House will not be in session until Wednesday, September 7, with votes at 6:30 that evening. With the significant amount of time - typically more than three hours - that is required to allow for a security sweep of the House Chamber before receiving a President, it is my recommendation that your address be held the following evening, when we can ensure there will be no parliamentary or logistical impediments that might detract from your remarks. As such, on behalf of the bipartisan leadership and membership of both the House and Senate, I respectfully invite you to address a Joint Session of Congress on Thursday, September 8, 2011 in the House Chamber, at a time that works best for your schedule. We look forward to hearing your ideas and working together to solve America's jobs crisis. MR. CARNEY: Good afternoon, everyone. Thanks for coming to the White House for your daily briefing. I have no announcements at the top, so we’ll go straight to questions. Q Thank you. The new budget projections that just came out predict 9 percent unemployment next year when the President is facing reelection, 1.7 percent growth for this year. Does the White House believe that the jobs initiatives the President is going to announce next week will change those projections for the positive? MR. CARNEY: Yes. Absolutely. As I mentioned yesterday, I think as I mentioned earlier this week, the President will come forward with specific proposals that by any objective measure would add to growth and job creation in the short term. And that will be part of a broad package that reflects his commitment to grow the economy now and to build a foundation for economic growth for the future to ensure that we win the future. So the answer to that is yes. Q So if Congress were to pass the package that the President is going to announce, unemployment would be under 9 percent? MR. CARNEY: I think based on -- when you’re talking about economic predictions, yes, economic analysts, economists, will be able to look at this series of proposals and say that based on history, based on what we know, based on their collected expertise, that it would add to economic growth and it would cause an increase in job creation. Q There was a bit of a flap. Is there anything that the White House would have done differently, in retrospect, in terms of consulting with the Hill or announcing the joint session? MR. CARNEY: Our focus from the beginning was to have the President have the opportunity to speak to the American people and to Congress, in front of Congress, at the soonest possible date upon Congress’s return from its long recess. Wednesday seemed to be the best option. When that wasn’t available -- or when that seemed to be a problem, Thursday was fine with us. And we are just looking forward to -- the President is looking forward to the opportunity to talk about what the American people really care about: the economy and the need to create more jobs. So we’re focused on that. Q So you would have gone through that process the same way? MR. CARNEY: All we care about here is that we address the issues that are most important. We’re certainly not interested in sort of inside-the-beltway political gamesmanship. What we are interested in is coming up with proposals that make sense, that can grow the economy, can create jobs, that by historical standards would have broad bipartisan support, and that if Congress comes back from their districts -- members of Congress come back from their districts and their states with the same sense of urgency that the President has, and having heard from their constituents the same things that the President heard when he went on his bus tour through the upper Midwest, everyone will come back with the same amount of urgency and focus to get this done -- because what the President will propose can get done, should get done and will benefit the country. Q Jay, Democrats are unifying around the advice that the President needs to go bold in his speech. Is that the way you would characterize the proposals that he’s going to roll out? And are there certain high expectations that one creates when you do a joint session of Congress speech? MR. CARNEY: I’ll leave it to you and others to characterize the speech in the terms that you just described. What will be the case, and the reason why the President wants to speak before Congress, is because this is an important moment in our economy and it is an important moment for the American people who are demanding that Washington put an end to the gridlock and bickering that has paralyzed the process here and take action to help the economy, to create jobs -- to help them. That’s what they want. They don’t want -- they’re not out there scoring political points. They want -- the vast majority of Americans, whether they voted Democratic or Republican, whether they’re registered with a party or not, they want Washington to work for them. They want them to take sensible actions to work for them -- to create jobs, to grow the economy. That’s what this speech will be about. That’s what the concrete proposals the President puts forward will be about. Q Economists, when you talk to them and ask them what would constitute “bold,” throw out figures like $400 billion in fiscal stimulus. Is he looking at anything on that scale? Is he going to give specifics about how many jobs he thinks this package might create when he unveils it? MR. CARNEY: I will not preview the speech any more than I really have, except to say that it will focus on the need to grow the economy and create jobs. It will be a collection of proposals that, again, should have bipartisan support, have had a similar -- at similar times have had bipartisan support, that will be, by any objective standard, pro-growth, pro-job creation, and that can be acted on right away if members of Congress come back from their recess ready to do things to help the American people. Beyond that, I’m not going to characterize it. Q You talked about bipartisan ideas that should have bipartisan support. Do you have any indication that some of these ideas will get bipartisan support, like are people in the White House consulting with people on the Hill about some of these specific proposals and have gotten some indication that they would be accepted? MR. CARNEY: In previous days, when you haven’t been here, I’ve been asked that question in a variety of ways. The President has consulted widely, as he had throughout his presidency, very interested in ideas that folks might have outside of his administration, in Congress, outside of Washington -- consults frequently with businessmen, with CEOs, with workers. And he has done that in this process. But beyond -- I’m not going to detail conversations he’s had or lay out which policy proposals may or may not have support from this segment or that segment of Congress. Q One more question. How has the President reacted to the whole debate yesterday over -- the issues over the scheduling of the speech? MR. CARNEY: I spent a great deal of time with him this morning and it never came up. Honestly. MR. CARNEY: I know you guys love this stuff. I know it’s catnip. But we’re really not focused on it. Q But there’s a basic question here. If you can’t even get the Congress to agree on a date for a speech without a political sideshow, how can we expect -- how can the American people expect that you can do something much more difficult, come up with a jobs plan, deal with the deficit? MR. CARNEY: Because the sideshows don’t matter. The economy matters. The American people matter. Jobs matter. And that’s what we’re focused on. That’s why -- you know, if Thursday is the day, Thursday is the day. We want to give this speech. The President wants to talk to the American people. The President wants to call on Congress to act. That’s what we’re going to do. Q But what does it say about your ability to get anything out of this Congress? I mean, you can’t work on a scheduling date for a speech. MR. CARNEY: John, it’s irrelevant and it’s -- this is small stuff. The issue is whether it’s -- we were -- Wednesday was the soonest possible day upon their return from their recess. Thursday is fine with us. He’s going to give the speech Thursday. MR. CARNEY: The issue about -- look, going back to what I said before, the cooperation, it’s about -- do the members of Congress return next week to Washington, having heard from their constituents that they’re fed up, right? They’re tired -- you and I have been in Washington long enough and covered this stuff long enough that the cycles of gridlock, cycles of partisanship -- not new, right? And people get frustrated with it because they think Washington is incompetent or broken. What they saw this summer is that it’s not incompetence, it’s dangerous. The incompetence, the gridlock, actually threatened and harmed the American economy, harmed the American people. That’s just not acceptable. So what I think and what we hope will happen upon Congress’s return is that they will have heard from their constituents that enough is enough and that it is time to actually do things that are productive, do things that are helpful to the economy, rather than retreat to your corner and hope that you win the partisan political battle for an ideological band within your own political party. That’s just not going to cut it. So the American -- so the President believes -- again, because he will put forward proposals that we believe should have bipartisan support, that faced with that imperative -- because everyone here is working for the American people, and the members of Congress, like the President, were elected by the American people -- will do the right thing and actually focus on the issues that matter, which -- the economy and jobs. Q But the only indications are bad, right? I mean, you had this kerfuffle over the speech, the super committee has had -- the only thing -- they haven’t even had a meeting of the full committee but the two sides have been off to their own corners, Democrats meeting with Democrats, Republicans meeting with Republicans. This doesn’t seem to be an auspicious start. MR. CARNEY: Well, I think you’re too focused on what’s happening within the narrow confines of not just this town but the handful of blocks between here and Congress. I think, again, members of Congress have to answer to their constituents. The President answers to every American citizen. They have heard -- they will have heard the imperative from the American people to put an end to the nonsense and get to work. And I think there is an opportunity here for the American people to drive this process, to have their demands heard, to -- we’re faced with a challenging situation. There’s no question that the recovery is moving too slowly, that we need to do something to boost growth, to boost job creation. That’s a number one priority, and any data you can come across that the American people have, number one priority of Democrats, independents and Republicans. So with that information, we should act. And the President is hopeful that Congress will want to join him in doing that. Q Jay, you blame partisanship, but isn’t this -- isn’t the real culprit here an inability to just communicate on the most simple terms? MR. CARNEY: No. No. We communicate all the time with Congress. We obviously spent a lot of time this year communicating with Congress. And this President has since he took office. The problem -- the problem -- I mean, you don’t need a civics lesson from me but I’ll give you one anyway. (Laughter.) No, but I think the problem is -- and I think everyone in here is aware of this -- is that the partisanship that -- and the apparent polarization that is sometimes observed here and felt here, is actually not very reflective of what’s happening out in the country, that the country is pretty unified when it comes to their priorities, when it comes to their belief that compromise is necessary, when it comes to their acceptance that the far ends of either spectrum don’t have the answers necessarily. So if you look back over our history, we’re closer together in many ways than we’ve ever been, and we ought to take advantage of that instead of fabricate false divides that prevent us from getting things done. Q Well, would you concede -- I mean, compromise requires effective communication between the two parties. And my understanding of what happened yesterday was that the President’s Chief of Staff first reached out to the Speaker at about 10:30 in the morning and delivered a message that the President wanted to speak to a joint session of Congress, but there was no give-and-take that is part of the regular give-and-take that goes on between a White House and the Congress about delivering a joint session of Congress. You cited from the podium congressional scheduling yesterday as one of the concerns and yet it appears that there was no one who checked with Congress about what’s the -- whether they could get everybody back in time to hear from the President, so you conceded on that point. Q What has happened with the communication between the President and his staff and the Speaker’s staff? MR. CARNEY: We have fine communication. And I think the focus on this is really yesterday’s story; it is not what people care about. We were interested in speaking Wednesday because Congress was returning, both houses, first day after Labor Day -- Wednesday -- after a long recess, that was the first day they were back. There were no initial objections to that. When problems were expressed, we said -- we talked about it and we said, fine, Thursday will work for us fine. Because the -- it’s just not very relevant. What matters is moving as quickly as possible to raise and then address the issues the American people care about -- the economy, jobs, the need to build a foundation that includes getting our fiscal house in order while we invest in key areas like innovation and education and infrastructure, building the capacity to compete in the 21st century against a world that’s growing more competitive. So I think that’s what people care about. They don’t care about what happened at 11 o’clock versus what happened at 4 o’clock. They care about what are we doing to make the economy grow, to help the private sector hire, and make sure that their kids are getting educated. Q Given yesterday’s failure to work this out behind the scenes, before there was this very public kerfuffle or spat, and given what happened during the debt ceiling, where there were people who are elected members who hung up on one another and wouldn’t return phone calls, what can you say today that would give confidence to the American people that Republicans and the President can actually work together to solve whatever hard problems facing this country, based on that track record? MR. CARNEY: I will go back to what I said to John and I think to Julie and others, that we believe that members of Congress -- House and Senate -- will have heard from their constituents what the President heard in Minnesota -- in small towns in Minnesota, in Iowa, in Illinois, what he heard the previous week in Michigan, which is that the American people -- Democrat, Republican, independent -- are tired of the bickering and they want reasonable compromise solutions to the problems that face the country. They want the government to do things that help the economy grow, that help private sector hire, and they don’t expect and they get frustrated by politicians who don’t listen to them. So I think everyone will have gotten an earful from the very people who sent them to Washington about what their priorities are, and I think that, because everyone here works for the American people, that that will have a salutary effect on their behavior -- we hope. Q Jay, following on that, you’re absolutely right. Obviously everyone knows sideshows matter less than helping people who are unemployed -- obviously. But you don’t seem to be acknowledging that there’s a process in Washington that has to be dealt with to help those people who are unemployed. And I think what John and Norah are suggesting is if the President is having this much trouble with the date -- you have James Carville saying on ABC today, “The last thing the White House needed was to appear to cave in to the Speaker, and that’s what happened.” So if there’s a perception even among Democrats that he doesn’t have enough clout with the Hill to figure out what day it is, how is he going to pass a plan to help the American people? Q It’s not an obsession. MR. CARNEY: -- is not -- what the American people expect the President to do, what the American people expect their senators and congressmen and women to do, is listen to them and take action. They do not give a lick about what day next week the President speaks before Congress. They want to hear from him. They want to know what his proposals are. They want to know that he has reasonable, sound, serious ideas to grow the economy and to create jobs, and that he’s going to pay for it and that he has a plan for getting our fiscal house in order in the long term. That’s what they care about. And they care whether or not Congress has similar ideas and is willing to take action on those ideas. They simply do not care about this stuff. Q Okay. So let me concede your point -- they don’t give a lick about what day it is, what time it is. Why doesn’t he give a speech from the Oval Office tonight saying, here’s my plan? MR. CARNEY: He wants to speak before Congress because he recognizes that while there are things he can do without Congress -- and he will do them -- there are actions that need to be taken with Congress that require legislation to grow the economy and create jobs. And he wants to go to Congress, speak directly to members of Congress, and lay out his proposals. The first opportunity to do that is next week, so that’s when he’ll do it. Q Okay. Last thing. The President visited the solar company Solyndra in May of 2010. He said, “It’s here that companies like Solyndra are leading the way toward a brighter and more prosperous future.” You probably heard overnight that yesterday this company, after getting half a billion dollars in government money, attention from the President, a visit, is filing for Chapter 11 and laying off 1,100 people. What does it say about the President’s policies so far, as he gets ready for this new plan, if this company he promoted, gave government money to, is going bankrupt and is laying off 1,100 people? MR. CARNEY: The whole purpose of this program, which has a broad portfolio of many companies that are doing well, was to invest in cutting-edge technologies that with some government assistance, with some government loan guarantees, would help us establish a beachhead in vital industries that will allow America to compete in the future. There are no guarantees in the business world about success and failure. That is just the way business works, and everyone recognizes that. And that’s why -- there’s over 40 companies, as I understand it, 40 guarantees involved in this program that merit looking at. There’s no individual -- you cannot measure the success based on one company or the other. Q You’ve said several times today and yesterday that the President wanted to speak to Congress at the soonest possible opportunity when they get back. Was this the plan all along, to give a speech to a joint session? MR. CARNEY: Well, obviously we discussed this as the President worked on his proposals and this was the idea settled upon. And once we thought -- the conclusion was made, the President decided that this is what he wanted to do, then we moved forward. Q And that decision was made yesterday? MR. CARNEY: It was made this week. Q It was made this week. Not to put too fine a point on it, but let me just ask you straight up -- did the President give in or capitulate to the Speaker on the schedule? MR. CARNEY: The President wanted to speak to Congress. Congress is back next Wednesday. That’s the first day that both houses -- senators and Congressmen -- are back in session. Therefore he requested that he speak Wednesday. If Wednesday doesn’t work, Thursday is fine with us, as long as he gets to speak to Congress. And he looks forward to doing it. Q And I know you are loath to get into some of the details that are being discussed for the speech, whether you’re going to go big, small, whatever, but the Mid-Session Review -- we’ve just been treated to a conference call that forecasted an average unemployment rate of 9 percent through the course of 2012. And you said that the President’s policies, if enacted, will lower that rate. Correct? MR. CARNEY: Well, again, I will say that objective outside economic analysts will look at it and say, if enacted, this plan will have a positive impact on growth and a positive impact on job creation. MR. CARNEY: I’m not going to make projections here, nor am I going to get into details of the proposals. MR. CARNEY: Again, I’m not going to get into projections or show any more leg on the details of the speech. What I am going to say is that there will be a series -- it will contain a series of proposals that are aimed at having a quick impact on economic growth and job creation. MR. CARNEY: You’ll have to ask OMB. I’m not -- I don’t know how that process works. MR. CARNEY: There are a lot of factors here. This has obviously been quite an interesting budget year. But these are separate issues here. The President is moving forward with a job and growth proposal next week, and the obligations to put out a Mid-Session Review that came out today -- these are not connected in any specific sense. MR. CARNEY: Again, I just said you have to ask OMB. I’m not sure how that works. Q Do you have a time for the speech on Thursday? MR. CARNEY: I don’t. I can assure you that, for all you football fans, that he will be completed before kickoff between the New Orleans Saints and Green Bay Packers. Q And then if you could just clarify -- you said yesterday and you’ve said today that the President and his team have consulted with Republicans on the Hill as he puts together this plan. MR. CARNEY: I’m sorry, what? MR. CARNEY: I think I’ve answered this about six times this week, but as I just said to Athena, the President has consistently throughout his presidency and including in recent weeks and months consulted with a wide array of folks within his administration, outside of his administration, in Congress, both parties, business and elsewhere, about economic ideas, proposals for growing the economy and creating jobs. That has been true throughout. It’s been true through this process. Q Because they say he hasn’t. And wouldn’t that be something that he would want to do? MR. CARNEY: Have you talked to every member of Congress? Q The Republican leadership in Congress said that they have not been consulted as he was putting together his plan. MR. CARNEY: He’s consulted widely, as he always does. He’s gathered ideas. His economic team and he have put together proposals that we are quite confident, if Congress comes back to Washington filled with a righteous sense of urgency about the need to grow the economy and create jobs, they will act on it and do the right thing by the American people. MR. CARNEY: I think I answered that question a half dozen times. Q Jay, in the hours between the letter from Speaker Boehner and your statement at about 9:18 last night, it didn’t seem as though you were saying, well, if Wednesday doesn’t work, Thursday is fine with us. Did it go to the President and he said, all right, fine, we’ll do it on Thursday? Is that what happened? MR. CARNEY: No, I think we were -- it was clear that we were in conversation with the Speaker’s office and looking at what the alternatives were. And I think, again, we’re talking about a matter of hours here, we’re not talking days and weeks -- resolved that Thursday would be the day, and that was fine with us. Q And the President made that decision last night? MR. CARNEY: The President makes all the decisions here. So we were discussing among ourselves, we were talking with the Speaker’s office -- we decided to go with Thursday. MR. CARNEY: It means that he’ll have the opportunity to watch the game like millions of other Americans. Q Jay, just one question on Solyndra. Should we assume that whatever money the taxpayers put into that in terms of loan guarantees, that is not going to be returned, that can’t be returned, it’s lost? MR. CARNEY: I don’t know the technical details of it, but I can take that or refer you to OMB -- or Department of Energy probably. MR. CARNEY: I think that it is a difficult process to know precisely what is in the hearts and minds of 535 elected members of Congress as they consider legislation. What we know with great confidence is that the proposals the President will put forward next week are reasonable and reflect, based on historic precedent, historical precedent, what should be bipartisan -- should receive bipartisan support, and I think that will be judged that way when he unveils it on -- on Thursday, rather. MR. CARNEY: I don’t -- I think it’s a distinction without a difference, because you could say that nothing could get congressional support, or you could say anything could get congressional support. I don’t know -- I mean, I think that, again, if members of Congress come back focused on the need to address the economy and hiring, they will view this proposal as an excellent path to take to grow the economy and create jobs, and a reasonable one, and one that merits broad support. That’s what we believe, and that’s why we’re coming forward with it next week. Q Just one last question following up on what Jonathan was asking, this idea that the President can’t get something out of this Congress, not even a date to speak. Is it fair to judge this President on what he gets out of this Congress? Or is it fair to judge him just on the proposals he lays out and his vision? MR. CARNEY: I think it is fair to judge the President on the actions he takes and the determination he shows to do what he was elected to do, which is, first and foremost, protect the American people and help the American people and the American economy. And he has done that since he took office, and he will demonstrate that again next week. That is his focus: What can I do as President, either administratively or with Congress legislatively, to ensure that the American economy is best positioned to grow, that the private sector has the conditions that will allow it to hire and encourage it to hire, and that the American people can go back to work? We have been through a horrible situation -- the worst recession since the Great Depression. We here, I think -- Americans in general, we can have short-term memory, I mean, it’s part of what makes us great -- we don’t spend our time wallowing in the past; we look towards the future. It is important to remember what we are emerging from and how serious the economic recession was. And this President has been focused on this since the day he took office, and he’ll be focused on it until, as he says, he knows that every American who wants a job and is looking for a job has a job. Q Jay, could you say that -- could you just explain a little bit about what the President expects to do and see and hear when he goes to Paterson, New Jersey, on Sunday? MR. CARNEY: Well, he, I think as you saw throughout the process -- Hurricane Irene -- very concerned about the devastation the storm was likely to cause and did cause. And the fact that it was not as severe as it could have been may be true, but we cannot lose sight of the fact that many, many Americans were severely affected by it, and some lost their lives. And obviously New Jersey was a very hard-hit state. MR. CARNEY: I think we’ll come out with more details about what his itinerary will look like on Sunday a little later. Q I mean, does he -- is going sort of for moral support or does seeing it firsthand better help him foment the government’s continuing response? MR. CARNEY: I think it’s very important that he’s -- to see up close and personal what the effects of a storm like this were, to talk to local officials, talk to affected Americans, talk to first responders and to those officials who are working on recovery, and hear from them. So he looks forward to doing it. Q Jay, does the White House feel that this President has gotten the respect from Congress that the office of the presidency deserves, with yesterday’s incident? MR. CARNEY: The White House spends zero time worrying about that. It spends its time -- we spend our time, the President spends our time focused on the job at hand. The job at hand is to come up with, propose and act on the things that we can do to help the economy and to help job creation, specifically for next week -- and obviously all the other responsibilities that the President has and the White House and the administration have. MR. CARNEY: -- you’re really making so much more of this than is merited, okay? The President will speak to the Congress in a joint session and to the American people next week. It’s an important time for our country; it’s an important time for the economy. He will speak directly to the people about what we need to do to grow the economy and create jobs, and he looks forward to doing it. Q One on Solyndra. Does the President have any regrets about having made such a big deal about this company? MR. CARNEY: The President -- the administration, the President is committed to, as I think I said, the idea that we need to make investments in clean energy technology, in the kind of industries that will be the -- that are the industries of the future, and that will be the job-creation engines in American in the future. If we intend to be number one in the 21st century the way we have been in the 20th and the early part of this century, we need to make those key investments. American history is full of examples of the federal government providing seed money in areas that allowed for explosive and economy-changing growth in certain areas, whether it’s the Transcontinental Railroad or the Internet. So the President is very committed to that, and, as I said before, that does not mean that each individual investment we made -- we do not change the rules of business by doing this. And by nature these can be high-risk but also very high-reward investments, and we are committed to that process. MR. CARNEY: I haven’t spoken to him about it. MR. CARNEY: Well, I think there were Republicans who thought investments in clean energy were a mistake, that they were ready to cede that vital industry to foreign competition, they were ready to cede the automobile industry to foreign competition, a million jobs there. We just disagree on that front. Q Are you satisfied that this company got the scrutiny that it should have had from the outset? MR. CARNEY: I refer you to DOE on the particulars of the process. We’re satisfied that this program was necessary and is working. Q Jay, thank you. When you say that the President will make some proposals in his address next week that will be things that he could do administratively, doesn’t he -- would that make up the bulk of his recommendations? MR. CARNEY: I simply said that obviously -- what I meant, or meant to convey through that, is that he’s -- I think I was asked why Congress, and that’s because we need to act with Congress. Much of -- some of what -- much of what we need to do requires legislation, requires action by Congress. That is why it’s important to go to Congress. He can also do things, as he has in the past, administratively that can help the economy grow, that can -- for example, the regulatory look-back that can free -- relieve businesses from burdensome regulations; other measures he can take administratively that don’t require legislative action, he will continue to do that as well. So that was not -- there are many pieces to this that are both legislative and administrative. MR. CARNEY: I have not -- again, we don’t have a specific time yet for when he will begin speaking, so I don’t have an answer to that. Q Jay, just to follow on two points that you made. You told Helene a couple minutes ago that you felt -- the President has sort of zero interest in the notion that the prestige of the office has been dented by this. Should he have zero interest? Isn’t the prestige of the office a significant component of having leverage in these negotiations? MR. CARNEY: Let’s just –- what he has zero interest in, and what the American people have zero interest in, is the petty political gamesmanship that goes on in here and that gets chronicled quite assiduously by the press, which is fine. But it is not what the American people care about, right? It’s just not. And, in fact, when they are forced to pay attention to it, they recoil in disgust. And they -- (laughter) -- you know, go out there and talk to regular folks. MR. CARNEY: I know you do, and I think that’s what you hear. That’s what –- when you go out into the country and you talk to ordinary Americans who are struggling to make ends meet, who are making sure they can get their car payments, ensuring that they’re saving money for their kids’ college education, who are coming up with great new ideas for -– to increase the productivity in their small business, tilling the field or working in the shop, they do not have any time for this. They do not have any time for the pettiness, the smallness, the posturing. And mostly they don’t even pay attention to it. And I think one of the things that I think that was so frustrating about what happened this summer is that because of the seriousness of the consequences of the posturing, they were forced to pay attention to it, and they were appalled by and scared by it. So that’s what -– look, the President is focused on the big things, the things that matter. And I think that’s what the vast majority of the American people are focused on. And I think that with any luck, that’s what members of Congress will be focused on when they come back. MR. CARNEY: I’m not going to -- first of all, I think you need to fine tune your reporting on what happened, but I –- and who was involved, but it is irrelevant. It really is. The President will speak to the nation and the Congress next week, as he hoped to do, and he will talk about some very important things that have nothing to do with communication gaps. Q But do you really think communications between the White House and Hill Republicans are fine? I mean, do you not see that there’s a problem? MR. CARNEY: What I think is that the issues trump that kind of stuff. And as you know, the President has a working relationship with the Speaker of the House. They’ve spent an awful lot of time together in person and on the phone this year. They will continue to do that. The same is true with the Democratic leaders of the House and the Senate, as well as obviously the Senate Republican leaders. So -– and other leaders and members of Congress. That will continue. The issues matter far more than this. Q But you don’t think something has to be fixed? You think the communications is fine? MR. CARNEY: I think politics needs to be fixed. Yes, the President says politics is broken. The American people are fed up with this. So we’re going to focus on the stuff that matters. And I think, listening to their constituents, that Congress is going to focus on it, too. MR. CARNEY: He became aware of this story when I walked into his office and among other subjects mentioned it to him, and it was new to him on Monday. Q And also, is the administration committed to seeing that all U.S. laws are enforced in this case? MR. CARNEY: Absolutely. We expect it to be treated –- I refer you to ICE and DHS and expect it to be handled like any other immigration case. Q On the things the President can do without Congress, you mentioned regulations. Can you give us some other examples of things he can do administratively or by executive order to create jobs? MR. CARNEY: I don’t want to ruin the surprise. MR. CARNEY: I mean, of course the President has certain powers. The executive branch has certain things it can do, and we’re always looking -- I refer to you –- I talked yesterday about – on the housing front, the measures that were taken to assist the unemployed; unemployed homeowners. That’s a measure that can be taken at the executive level, administrative level to help homeowners on an economic issue. There are just a variety of things we can do. MR. CARNEY: Thanks, you guys. An estimated 85.5 percent of American households were food secure throughout the entire year in 2010, meaning that they had access at all times to enough food for an active, healthy life for all household members. The remaining households (14.5 percent) were food insecure at least some time during the year, including 5.4 percent with very low food security—meaning that the food intake of one or more household members was reduced and their eating patterns were disrupted at times during the year because the household lacked money and other resources for food. The prevalence rate of very low food security declined from 5.7 percent in 2009, while the change in food insecurity overall (from 14.7 percent in 2009) was not statistically significant. The typical food-secure household spent 27 percent more on food than the typical food-insecure household of the same size and household composition. Fifty-nine percent of all food-insecure households participated in one or more of the three largest Federal food and nutrition assistance programs during the month prior to the 2010 survey. Charts and graphs (in .png format) from this report are available in the .zip file listed below. The .zip file also contains a document (readme.txt) that lists the name and title of each chart or graph file. by ORC International on September 9-11, 2011.
reducing the budget deficit, or more attention to creating more jobs? The margin of sampling error for results based on the total sample is plus or minus 3 percentage points. The sample also includes 943 interviews among registered voters (plus or minus 3 percentage points). The third time was not the charm today when it came to persuading Senate Republicans to abandon their never-ending quest to prevent the wealthiest Americans from having to pay their fair share and to instead join with Democrats to put hundreds of thousands of Americans back to work. Earlier this afternoon, Senate Republicans again voted unanimously against 450,000 Americans jobs. Oct. 20: 100 percent of Senate Republicans voted against nearly 400,000 jobs for teachers, firefighters, and copsin order to protect the very wealthiest Americans — the top 0.5 percent — from having to pay their fair share. Today: 100 percent of Senate Republicans voted against 450,000 Americans jobs rebuilding our crumbling roads, bridges, airports, and other critical infrastructurein order to protect the very wealthiest Americans — the top 0.5 percent — from having to pay their fair share. The single most important thing we want to achieve is for President Obama to be a one-term president. That’s my single most important political goal along with every active Republican in the country. With 51 percent of voters saying that jobs and the economy are the most pressing issues in the nation today, 49 percent said they believe that the Republicans are intentionally hindering efforts to boost the economy so that President Barack Obama will not be reelected. Thirty-nine percent disagreed. As expected, most registered Democrats (70 percent) agreed that Republicans are intentionally hindering the economy and hurting Obama, but independents (52 percent) and even some Republicans (24 percent) also agreed. Mr. Mayor, thank you for flying back from Brazil and getting off a plane and coming straight here. If I were you, I’d be home in bed trying to catch up on my sleep. And I want to tell you something, I know I’m back in Iowa when the guy introducing you from the factory floor speaks better than you do, I know I’m back in -- I know I’m back in Iowa. (Laughter and applause.) Incredible state. You’re an incredible state. I understand the Mayor of Eldridge is here and -- Martin O’Boyle. Terry, thank you for the opportunity of allowing me on the factory floor here, and I understand the chancellor of Eastern Iowa Community College, Don Doucette, is here. Don, where are you? Thank you very much, Don. I’m going to talk about what you guys are doing in just a minute. And, folks, first of all, as it relates to the story that was just told by Chuck, it reminds me, my dad used to have an expression. He’d say -- I mean this sincerely, a guy who had lost jobs, a guy who had to move and move his family -- he said, Joey, you got to understand one thing, a job is about a lot more than a paycheck. It’s about your dignity. It’s about your respect. It’s about your sense of yourself. It’s about your place in the community. And too many people have been stripped of their dignity as a consequence of this God-awful recession we’ve inherited. And we’re determined -- we’re determined -- I think all of us, Republican and Democrat -- are determined to turn that around. But first I want to thank -- I want to thank Terry, the president of PCT, and I also want to thank the community college for doing what is a remarkable thing that's happening all across America, for partnering -- for partnering with this great company and producing jobs, making sure the skills available match the needs. Because, folks, the facts are -- and you’re going to see more of them -- the facts are that the jobs that left the United States are coming back to the United States. Plants that closed are opening, opening and reinvented. Companies like John Deere expanding here in Davenport and in Waterloo and in Des Moines, where they added nearly 500 new jobs in the past two years, good paying jobs. Siemens Wind employs 500 people at Fort Madison. Sixty-five percent of them used to work in companies in the area that are either closed or downsized. So, folks, America is coming back. It’s not a political slogan; it’s a reality. And it’s happening in the sector that built the middle class in manufacturing. Look, you know a lot of my Republican friends and some of our political opponents wonder why the President and I have spent so much time working to bring manufacturing back. No one in the Heartland has to wonder about that. You all know why. You all know why because you were the manufacturing center of the world, and you saw what happened when those jobs were lost. You know that manufacturing jobs just aren’t any old jobs. They are good paying jobs; jobs you can raise a family on. Jobs that allow you to own a home and not just rent; jobs that give you the promise of being able to send your kid to college. And here in Iowa, the average manufacturing job pays almost $50,000 a year. And they’re jobs that matter to everyone, as was mentioned by Chuck, because they not only are good for America -- they’re good for America, because they make America competitive again. And they’re jobs of building products of the future in industries of the future for an economy that’s able to compete for the future, products like the electronic beam systems built here at PCT -- remarkable. These are jobs building products that export to consumers not just here but all around the world, expanding world markets for the United States of America. You know about that too. Fifty percent -- all the workers here know that 50 percent of what they produce here at PCT Engineering are sales that are destined to be exported. That’s a big deal. They’re jobs that anchor our communities. They’re jobs that get the local community moving again, manufacturing jobs. 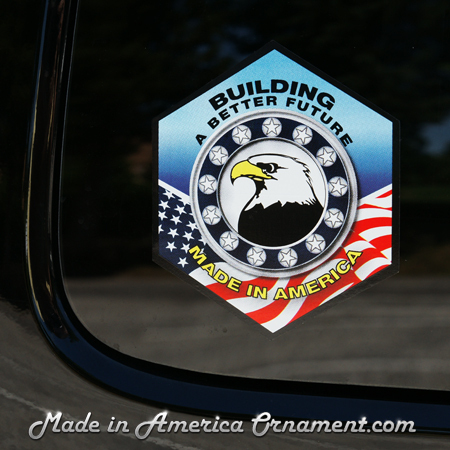 Manufacturing jobs create more jobs, other jobs -- jobs in diners, hardware stores, schools, police departments. But most importantly, they’re jobs that can help rebuild the middle class, which has been battered. And nobody knows it better than all of you. Look, it matters because real growth, growth that is widely shared, the only growth that really matters -- growth that is widely shared by everyone in this country -- can only happen when the middle class is growing again. When the middle class is growing, everyone does well. The wealthy do very well, as they should, and those who are not wealthy have a shot, a ladder maybe they can climb up to change their circumstance. But the middle class will only grow if we build an economy that can support the middle class. And manufacturing is not the only part, but it’s a critical part to bringing back the middle class. And no one knows that better than the people of Iowa, who know the essential role that -- it’s not only manufacturing. Look at Iowa and agriculture and the role agriculture plays in the economic health and well-being of this nation. That’s why the President and I are so proud that last year farm exports reached a record high of $137 billion, $23 billion higher than ever before. That’s not only good for the economic well-being of Iowa farmers, it’s good for the economic well-being of the entire country. And with the new trade agreements the President negotiated, we expect an additional $2.3 billion in the coming years in agricultural products supporting an additional 20,000 jobs here at home. But it’s not only the agricultural sector that’s going to benefit from these new trade agreements. It will create tens of thousands of more jobs in manufacturing in the high-tech sector because of these agreements. And, folks, we’re not just fighting harder to be able to export our products -- agriculture or manufactured -- abroad. They’re important, but we’re fighting to export complex, high-tech services as well, services that Americans provide better than any other people in the world, but things most people don’t think about -- (applause) -- things most don't think about, that they contribute and contribute tens of billions of dollars to our economy like construction, engineering, health care technology, IT. We do that better than anyone in the world. We recently signed an agreement, after my negotiations with the Vice President of China, opening America’s automobile insurance industry to the largest automobile market in the world. You say, what does that have to do? If you have access for American automobile insurance companies to sell insurance, which has been blocked up to now, in China to the largest number of folks in the world who drive automobiles, that’s real money. That’s real jobs. That’s real jobs back here at home. But ultimately, it all comes down to the same question, the real question, quite frankly, of this election and the challenge of our time -- will we be a country that values the role of workers in the success of businesses and values the middle class in the success of the economy or are we going to move backwards to the same disastrous philosophy that rewarded speculators rather than builders? Look, this is the third in a series of speeches I’m giving on behalf of our administration laying out the stark choices we believe the American people are going to face in November and what’s at stake for the middle class. Today, I want to focus primarily on manufacturing because President Obama and I -- President Obama and I have been working to rebuild our manufacturing sector and rebuild our country because we think they're one and the same. We don't know how you do one without the other. We don't know how you leave it out, manufacturing and rebuild the country. So let me tell you what we’ve done, but maybe equally as important, let me tell you what we think we have to do, what more we have to do. When we came into office, the manufacturing sector, had been neglected badly and was getting devastated. During the 2000s, before we came in, 5.8 million manufacturing jobs were lost in the United States of America. Right here in Iowa, you lost 53,000 manufacturing jobs. You saw companies like Maytag and Electolux and many others close shop. Thousands of factories closed out and laid off workers, a lot of them reopened in places like Vietnam, Mexico, China, “cheaper markets.” And we were told -- how many times have you been told over the last 15 years that America’s days as a leading manufacturer in the world had passed? Look, the President and I said, where is it written, where is it written that says our day has passed in anything? The President and I fundamentally disagreed with that proposition. And by the way, it was a widely held proposition, not just with our friends on the other side, with a whole lot of people. We knew -- we knew we had to get manufacturing back on its feet again because for every one of those manufacturing jobs lost, somebody lost their place in the middle class. For every one of those jobs lost. So we went to work first and foremost over significant opposition, and with Mitt Romney arguing that we should let Detroit go bankrupt. THE VICE PRESIDENT: What we did is we rescued the auto industry. We administered some of the very toughest medicine -- (Applause.) We were criticized by many on our side. We administered some very tough medicine, but together we saved literally 1 million jobs. Folks, we knew that was essential, but not enough, so we went to work to provide a skilled workforce for companies that have already come back or are bringing their folks back. We met with the leading companies in the world who came to the White House in January. They pointed out to us that right now there are 600,000 manufacturing jobs in the United States that companies who have come back home can't fill because of their inability to match the workers’ skills with the need of the companies. So we launched a partnership between what my wife, Jill, who is a community college professor, calls the best-kept secret -- (Applause.) Beautiful. What my wife, Jill, calls the best-kept secret in America, American community colleges. And businesses looking to fill those 600,000 slots married up with them. We’ve also proposed an $8 billion partnership to give more momentum to this effort. My wife and the Secretary of Labor, Secretary Solis, just did an 800-mile bus trip, starting off in Iowa, working all the way -- their way through Tennessee, Kentucky, Virginia, North Carolina, visiting community college and business after community college and business, providing hundreds and hundreds of good paying jobs because they're training directly, exactly what the companies need. And it was all over the countryside, from Tennessee, to North Carolina, to Michigan, Ohio, New Hampshire, and it’s working. So let me say it again, thank you, Terry. And thank you, Dr. Paper, and thank you, Chancellor -- Dr. Paper, and thank you, Chancellor, for this partnership of yours. You are one of the reasons why. You’re literally one of the reasons why American companies are now insourcing instead of outsourcing. In addition, the President has signed into law three free trade agreement with Korea, Colombia and Panama. They're going to open up markets for the best products in the world -- for the best products in the world, Made in America products, to all those countries, which now can't get into those countries and are committed to leveling the playing field across the board. To that end, we created for the first time a thing we call the Trade Enforcement Unit, whose sole job is to crack down on countries that pursue unfair trade practices. We’re not -- we don't think that's a trade war. We think that's a fair way to trade. And so just this month, we brought a new trade case against China. China is unfairly limiting American access to so-called rare earth materials that they possess, that are needed by American manufacturers to make high-tech products like electronic vehicles and advanced electronics. Look, even more to come as they invest in new plants and equipment right now, right now if they invest, by allowing them to write off more rapidly the cost of the factory, the cost of the equipment, the cost of their vehicles so they can expand opportunities. That means more people being hired. The bottom line is we’re changing the paradigm here. We’re rewarding instead of penalizing American companies that invest in building and hiring here in America, and manufacturers are responding. They're hiring workers by the hundreds of thousands. They're exploiting products all around the world. Ladies and gentlemen, ladies and gentlemen, when he was CEO of Bain Capital, Bain Capital closed down two factories in South Florida that made medical devices, moving the production to Germany. They shut down a plant in South Carolina and cut jobs in another one in Rhode Island that made photo albums and picture frames and outsourced production overseas. I’m tempted to say, Mitt, thanks for the memories. (Laughter.) You know what I mean? As governor of Massachusetts, he repeatedly slashed funding for workforce training in manufacturing specifically. And despite the fact that millions of taxpayer dollars were flowing to companies outsourcing state services like overseas call centers, he vetoed a bill passed by the Massachusetts legislature that would have stopped the state from outsourcing contracts overseas, state contracts. Look, think about it, a Massachusetts taxpayer with a question -- this is how it works -- with a question about Massachusetts state services, picks up the phone, dials an 800 number expecting to talk to somebody in the Massachusetts government to get an answer to their question. And instead, he talking to -- or she’s talking to someone on the other side of the world and all of it paid for by his or her tax dollars. I find that kind of fascinating. (Laughter.) No, I really mean it. I mean, that’s one when I was told about, I said, I’m not going to say that until you fact check that for me again. But think about it, it’s one thing for the local company to outsource a call service, but for the state government to outsource a call service that’s set up to answer questions for people in the state about a problem they have with the government, to outsource that, denying folks in Massachusetts the jobs that are attendant to that? Is it any surprise to you that Massachusetts, under Governor Romney, was losing manufacturing jobs twice as fast as the rest of the country? Now, as a presidential candidate, he has proposed a new international tax system that zeroes out taxes for companies that create jobs outside the United States of America. I’m not making this stuff up. Look, your -- President Obama and Governor Romney, Joe Biden, and whoever the nominee is going to be, we are talking about taxes and the burden on manufacturers. But there’s a big difference. Our tax cuts go to companies that create jobs over here. The Romney tax cut goes to companies that create jobs overseas. It’s a fundamentally different philosophy from ours. When China was dumping tires into the international marketplace, hurting American manufacturers of tires and their workers, President Obama stepped up and enforced our trade laws and won. Governor Romney, at the time, called what the President has done protectionism. That’s his quote -- “protectionism.” Now, when it’s politically expedient, he wants to get really tough on China. So, look, folks, we have a choice in this election between our philosophy that believes manufacturing is central to our economy and their philosophy that scoffs at it, between our philosophy that says there is nothing out of touch about fighting for the future of the middle class by creating manufacturing jobs -- a philosophy that says if the folks at the top -- and their philosophy says if the folks at the top do well, everything else will do well. How many times have you heard about the job creators? Look, Governor Romney’s business practices and his policies have clearly benefited the wealthy and most powerful among us, often at the expense of working and middle-class families. They actually believe it’s the best way. I’m not doubting their belief. But it just doesn’t work that way. Folks, I stood outside of a lot of plant gates in my career, both here in this state, the state of Iowa, and in my home state of Delaware, shaking hands and asking for support. I've also stood outside those gates -- like the General Motors gate of my home state -- asking those -- when those workers needed my help because the plant was shutting down, going somewhere else. Those are the days that stick with me the most in my career. Those are the days when the longest walk that these folks were taking wasn't from the factory floor to the parking lot for the last time, it was up that flight of stairs they had to go up once they got home into their child's bedroom to say, Honey, I'm sorry but you're not going to be able to go back to Roosevelt High School, or St. Mary's, or not be able to be in that little league; Daddy, Mommy, I lost my job. We've got to do something else. My dad made that walk when I was young. An awful lot of kids heard the same words I heard, except the difference between then and now was that my father said everything was going to be okay. In the mid ‘50s he believed it, and I believed it. So many people have made that walk in the recent past five, six, seven years, and they can't even say with certainty when they look at their child up until now, it's going to be okay. But the good news is that today, hundreds of thousands of workers are replacing that longest walk with walks of a totally different journey. (Applause.) A journey that ends with workers who are able to come home and say, I've got a job -- just like you were. (Applause.) I've got a job. They've been able to say, I've got a good job building amazing products that the world wants to buy. That’s what makes me so optimistic. We've got a way to go yet, but knowing these journeys are taking place again in the thousands -- more of them every single day. Once workers accept $7.50 per hour wages and employers have the ability to fire anyone for any reason this country will be back on track. 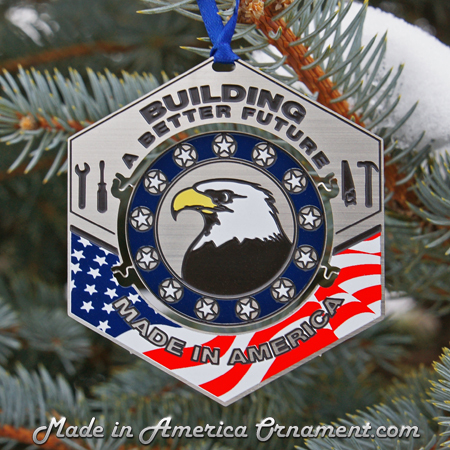 Support American Manufacturing and help us keep jobs in the United States by purchasing one of our Made In America Ornament or Made In America Sticker. A nearly $25 million Recovery Act tax credit helped General Electric transfer its manufacturing operations of hybrid water heaters from China to Kentucky’s Louisville Appliance Park, making it the first new plant opened there in more than 50 years. Kentucky state and local governments put up $17 million toward construction costs. The majority of Recovery projects are funded by stimulus contracts, grants, and loans, while Recovery tax credits – about $300 billion total – are most often used to offset losses from the recession or to provide for energy efficiency. But in this case, GE used a sizeable tax credit to offset construction costs of the new facility, which GE says can make the product more competitively than in China. GE’s hybrid water heater combines energy-saving heat-pump technology with traditional electric heating elements, requiring less than half the amount of energy needed to operate a conventional electric water heater. The hybrid “and other recent investments at Appliance Park has also created hundreds of highly skilled salaried jobs in fields like engineering, industrial design and manufacturing,” the company said. DOE said the hybrid water heater was inspired by research efforts pioneered in the late 1990s and early 2000s at Oak Ridge National Laboratory. GE Appliances today announced the opening of its GeoSpring™ Hybrid Water Heater manufacturing facility at Appliance Park in Louisville, Ky. – the first to open there since 1957. The $38 million investment in the new product and a revitalized facility is the first milestone in commitments GE has made since 2009 to invest a total of $1 billion ($800 million in Louisville) and create more than 1,300 new jobs in the U.S. by 2014. The new product and other recent investments at Appliance Park has also created hundreds of highly skilled salaried jobs in fields like engineering, industrial design and manufacturing. Lean manufacturing and a more competitive wage structure for new employees led to the selection of Louisville as the production site for the new water heater instead of China, where an earlier version of the product was made. Not only can the new product now be made more competitively in the U.S., the GeoSpring Hybrid Water Heater, developed by the Louisville team, has an enhanced feature set, offers better performance with greater energy savings and will be more affordable for consumers. The GeoSpring has the distinction of being the first GE Appliances product designed and built using Lean manufacturing principles. The Lean process, which uses a cross-functional team of employees – including hourly manufacturing workers – to design the product and the manufacturing process, will help increase the competitiveness of the operation by identifying and removing waste in materials and work effort often found in traditional manufacturing. State and local governments also supported putting the new GeoSpring in Louisville with up to $17 million in incentives to design and build the new energy-efficient facility and other investments that the company will make at Appliance Park during the next several years. Saves approximately $325 per year, less than half the cost of a conventional electric water heater — that's $3,250 in savings in energy costs over a 10-year period based on 10.65 cents per kWh. The GeoSpring Hybrid Water Heater combines energy-saving heat-pump technology with traditional electric heating elements. Hybrid technology absorbs heat in the ambient air and transfers it into the water. Since this requires much less energy than the energy used to generate radiant heat – as used in a conventional electric tank water heater – the GeoSpring Hybrid Electric Water Heater is more economical to operate. GeoSpring will be available in March at national retailers such as Lowe’s and Sears and national plumbing distributors such as Ferguson, as well as many local retailers and distributors. For more information on features and availability visit GEAppliances.com/american-made-water-heater/. State and local tax credits and utility rebates for purchasing the energy-efficient water heater may also be available to benefit consumers. *Based on DOE test procedure and comparison of a 50-gallon standard electric tank water heater using 4879 kWh per year vs. the GeoSpring Hybrid Water Heater using 1830 kWh per year. In the next 5 years we will see the emergence of a world middle class that will want goods just like we do. Now is the most opportune time to invest in United States companies manufacturing here that will be ready to meet the world demand.